Super Aramith Pro-Cup Television Edition billiard ball set. 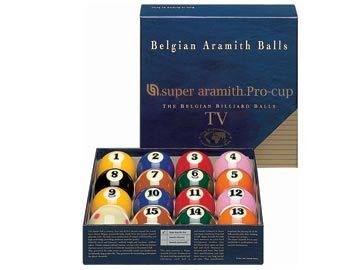 Super Aramith Pro TV balls are designed specifically for the TV viewer by changing specific colors of certain balls. The #4 and #12 balls are pink and the #7 and #15 balls are a light brown. Another added bonus to the new set is it now includes the the Pro-Cup cue ball. These balls meet all professional quality specifications: density, balance, diameter, roundness, color, gloss, hardness and weight. This ball set has outstanding endurance through hardened vitrified surface with ultra-high density for exceptional scratch and impact resistance.